Las Vegas, Nevada is undoubtedly the party capital of the world, so combine the unparallelled energy of the buzzing Las Vegas Strip with the raw and powerful rugby that the World Sevens Series brings to town, and you have a match made in heaven for a weekend trip to remember. 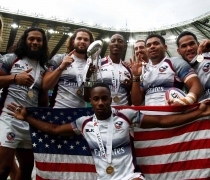 And with no clash with the 6 Nations Championships this year, this could be the perfect time to visit Vegas and embrace the 7s. USA Rugby Sevens commences at the Sam Boyd Stadium. VU Ltd offers the best hotels, tickets and travel to this outstanding tournament and can bespoke a travel package to suit your needs.